Every city is unique, but there's nowhere akin to Istanbul. Straddling two continents, Istanbul (once Constantinople) has always been a place of vibrant fusion between east and west. The last stronghold of the Roman Empire, the beating heart of the Byzantine Empire and the Ottoman capital. Istanbul's history is one of dramatic sieges and conquests, and of immense trading wealth. Much of Istanbul's glorious past is still visible and visitable. Amongst the famous domes of mosques and graceful Orthodox churches visitors can see the Roman catacombs, Byzantine battlements and Ottoman palaces - many of which have now been converted into some of the best places to stay in Istanbul. History presents itself at every turn in Istanbul and the world famous Blue Mosque is a great starting point for exploring this rich heritage. The Hagia Sophia is an incredible museum that is a must for anyone interested in the city's history. Palaces abound in this incredible city and two of the finest are Topkapi and Dolmabahçe. Boasting a wide array of bazaars and markets, the labyrinthine Grand Bazaar encapsulates Istanbul's manic market life. Also look out for the wondrous Spice Bazaar. Mosques and churches stand side by side in the city and one of the finest examples of Christian architecture is the Basilica Cistern. Istanbul's golden days are certainly not behind it. This city is as lively as ever, packed with great restaurants, forward thinking galleries and 'hip' bars and clubs. Istanbul's position, on both sides of the Bosphorus, which is a narrow straight between the Black Sea and the Marmara Sea, can probably be held responsible for the city's importance and wealth, but also its desirability when it came to plunder. The city's variety is reflected in its range of hotels and our list of the best places to stay in Istanbul range from former palaces to small-scale boutiques. Sari Konak offers elegant and great value rooms, including triple suites for groups or families. Plus a roof terrace with fabulous views. The Empress Zoe is in an excellent spot, and effortlessly combines period style with modern comforts. There's the added bonus of a pretty garden for relaxing in. Çira?an Palace Kempinski has arguably the most stunning pool terrace in town, plus well regarded restaurants and a top notch spa. 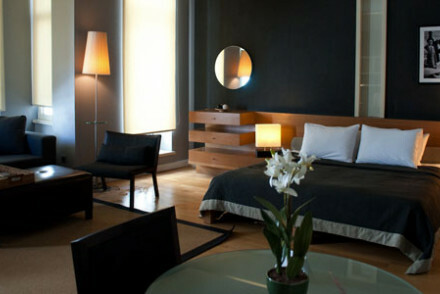 Georges Hotel Galata focuses on elegant simplicity. Mixing high-quality design with laidback glamour, this hotel is a magnificent place to relax. Enjoy fantastic French cuisine and stunning views out over the city. 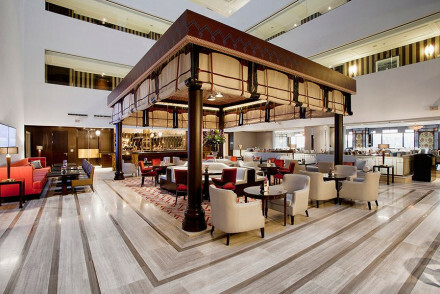 Hotel Les Ottomans is a must for those who love over the top luxury. The pool terrace is lavish and the rooms make you feel like a Sultan or Sultana. Mama Shelter nails the minimalist chic aesthetic. Offering stylish rooms, a buzzy restaurant and a winning location, this is superb value for money. 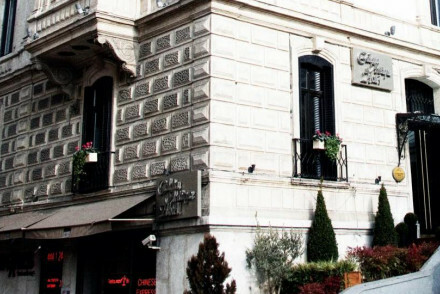 From the outside a neo-classical 19th century mansion, Galata Antique is a totally different story inside. Dominated by sharp design features and tasteful furnishings, this hotel combines a great location with a great vibe. 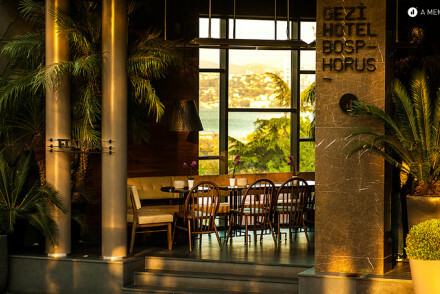 The House Hotel Nisantasi is representative of the sophisticated area that it's found in. The sleek design is superb and creates a luxurious hotel service. A pearly white mansion on the river, A'jia Hotel exudes class. The elegant rooms offer beautiful views out over the river and the waterside restaurant is a glorious place to spend an afternoon. 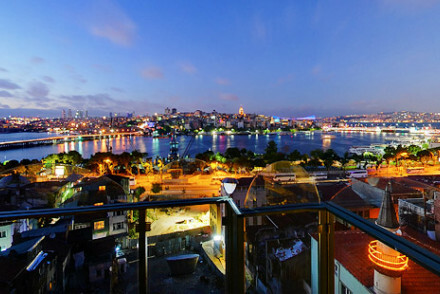 Sumahan on the River offers designer loft-style rooms overlooking the Bosphorus. Set in the charming district of Cengelkoy, this is a great option if your looking to escape the hustle and bustle of the city centre. 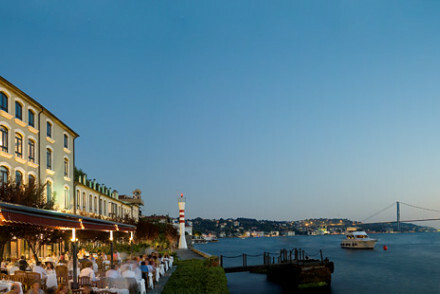 There can be few better places to enjoy the magic of the Bosphorus than The House Hotel Bosphorus. The lovely rooms utilitse natural light and offer great views and the hotel's restaurant is a real winner. Set in Ortakoy, a small village outside the city centre, it's a quiet place to retreat to. 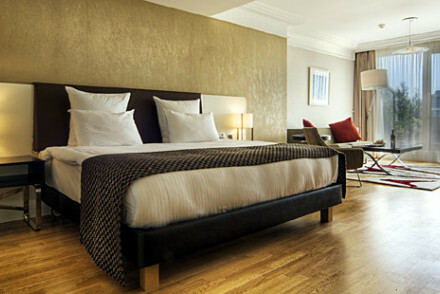 The Hotel Witt Istanbul Suites is a must for the design conscious offering sleek modern lines and minimalist interiors. 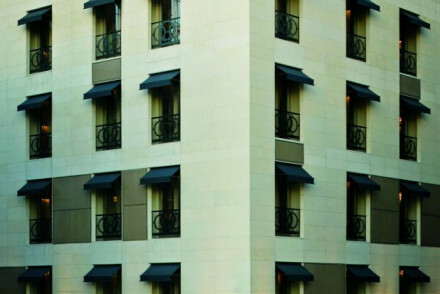 The Ritz Carlton offers top notch facilities aimed at both the business and leisure traveller. Great spa and pool, plus a range of bars and restaurants. HHK boasts a swimming pool & roof top terrace bar with great views over the city. Doubles start from just £75 per night B&B. 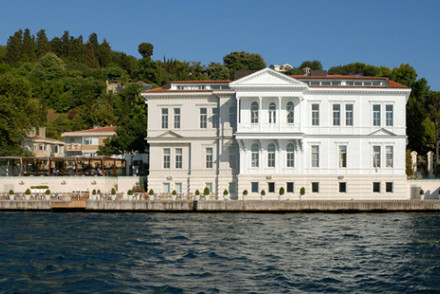 Portus House is a stylish guesthouse close to the Bosphorus. If you don't mind sharing a bathroom, you can pick up a double room for only £49 per night B&B. Hotel Nomade combines a fantastic location with great value rooms. The biggest selling point is the hotel's incredible rooftop bar that offers stunning views out over the tops and turrets of Istanbul. International flyers want to head for Istanbul Airport. Istanbul in the summer can be stiflingly hot, so we recommend visiting from April to May or September to November. Browse through our list of all the best places to stay in Istanbul. An elegant base for exploring the sights of Sultanahmet. Fantastic views over the city and sea from the roof top terrace. Rooms festure parquet floors and cream furnishings dotted with Turkish artifacts. The triple suites are ideal for groups or families. 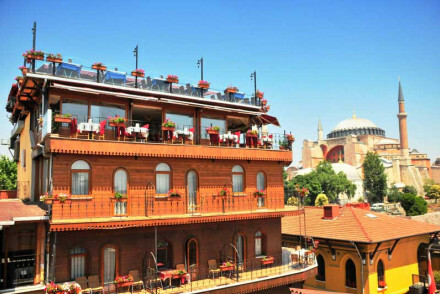 Value chic - Great value for this chic and central hotel in the historic Sultanahmet district with roofterrace views of the Blue Mosque. Families - A perfect base for families, the suites can accomodate up to four people and boast wonderful views of the Marmara Sea. Local markets - Test out your haggling skills in the Grand Bazaar, an ideal spot to pick up presents. 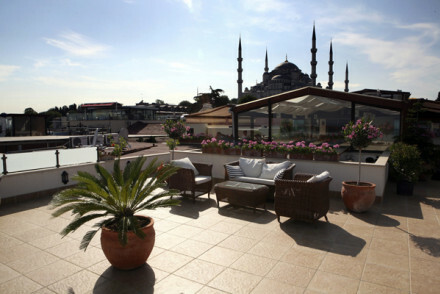 Sights nearby - This central hotel is walking distance from the Blue Mosque and Hagia Sophia. 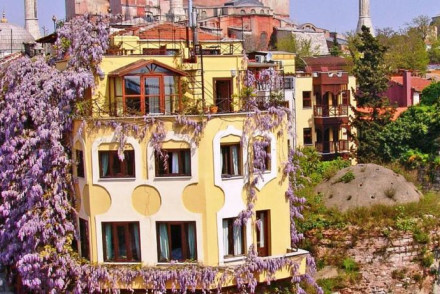 A small simple guesthouse close to the Bosphorus. Charming contemporary rooms have white walls, exposed brickwork and splashes of colour. A great location and excellent value. 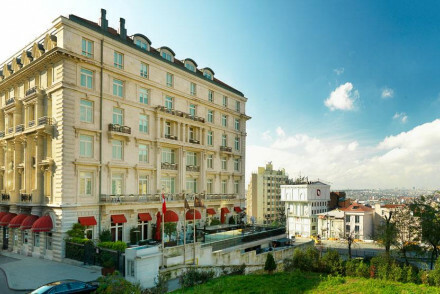 Set in an elegant historic building, Karakoy Rooms is situated right in the heart of Istanbul. Offering extremely spacious light-filled rooms complete with parquet flooring and chic white interiors, some even boasting lovely sea views. A highly modern hotel designed for the 21st century visitor, whether travelling alone, as a couple, in a group or as a family. Chic contemporary white rooms with all the mod cons. Meeting spaces, restaurant, bar and terrace. Excellent value too. Well designed combination of period style and modern facilities in this Ottoman house and adjoining 15th-century Hammam. Attractively furnished rooms with antiques, Turkish rugs, wall-hangings and Islamic folk art. An ‘archaeological garden’ for relaxing in. A tranquil crashpad in central Istanbul. Hideaway - A quaint hideaway right in the city centre with stylish rooms, a lovely rooftop terrace and a tranquil leafy garden. 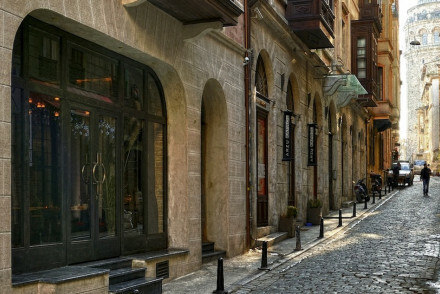 Local markets - Explore the warren alleyways of the Grand Bazaar and discover its hidden jems. Sights nearby - Close to all the main sights including the Blue Mosque and Topkapi Palace. A sophisticated collection of apartments with kitchenettes in a bustling area of Istanbul. Chic contemporary suites have parquet floors, quirky interior design, all the mod cons and stand alone bath tubs. A stylish spot for couples and families. Luxury hotel in historic 19th century Neo-Renaissance mansion. Elegant rooms have funky individual decor, high ceilings, marble bathrooms and double glazed windows. 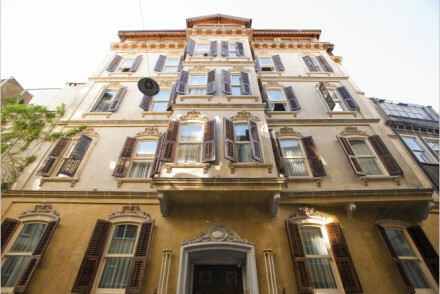 Centrally located in city, within walking distance of sights including Galata Tower and Taksim Square. Roof terrace with city views. Fun hotel in the heart of Taksim in Istanbul. Rooms modern and contemporary, with individual decor, free wifi, air conditioning and private balconies. Centrally located close to bars, restaurants and historical sites. Hip and stylish. Ideal for a city weekend break. A gorgeous haven of peace and tranquility in a quiet neighbourhood. Chic, contemporary, and understated living space filled with natural light, wooden floors, characterful pieces of furniture. Rooms and connecting rooms are spacious and modern. A unique spot with no frills attached. 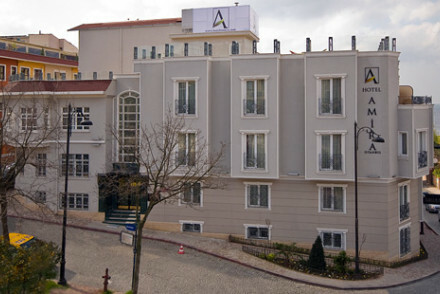 A quiet hotel in a traditional Turkish neighbourhood. Rooms are elegant with creamy furnishings. Swimming pool, restaurant, and roof top terrace bar. A charming spot and great value too. 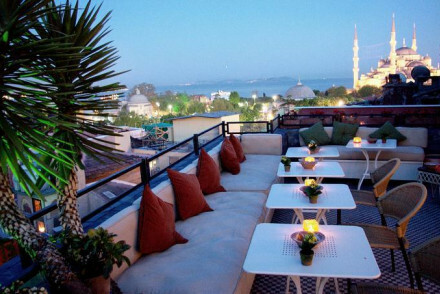 Boutique hotel located in Sultanahmet, with a spectacular and unique panorama view from its roof top restaurant. Chic rooms in Ottoman style decor and friendly staff ensure great value for money. Ideally situated to explore Istanbul. Value chic - A charming boutique with elegant suites and a rooftop terrace overlooking the Topkapi Palace, Hagia Sophia and the Blue Mosque. Local markets - Just a 15 minute walk from the Grand Bazaar where you can pick up any number of things. Sights nearby - Blue Mosque and Hagia Sofia are within walking distance of the hotel. Great walks - Take a sunset stroll along the coast and admire the fantastic views. 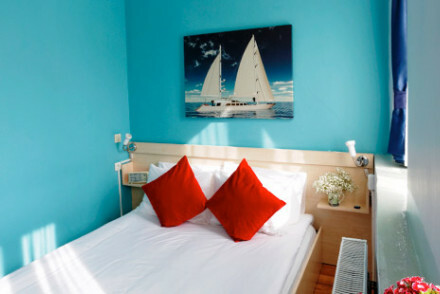 Uniquely furnished hotel which combines maritime design with a focus on comfort. Located between the old and new cities of Istanbul, allowing for easy forays into both sides of Turkey's capital. Full Turkish breakfast brought to your room, where anti-stress mattresses and LED TV come as standard. 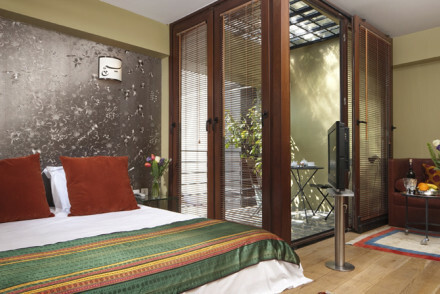 A chic boutique hotel in the heart of Sultanahmet. Sophisticated rooms in reds and ochres with all the mod cons. Lovely living areas and an outdoor terrace. A stylish city spot for a weekend in Istanbul. Sights nearby - Blue Mosque, Topkapi Palace, Hagia Sophia, village of Sanyer. An old building boasting chic modern interiors in the trendy district of Karaköy. Sleek rooms feature high ceilings, cool steely grey hues, crisp white linen and fabulous modern bathrooms. Splash out and book the penthouse suite for epic city views. A stylish city base. 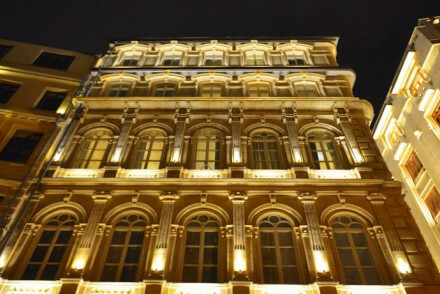 City Style - A stylish hotel in the hip district of Karaköy. Sights nearby - Stand at the top of the Galata Tower and admire the city views. Local markets - Discover the bustling narrow alleys of the spice market. 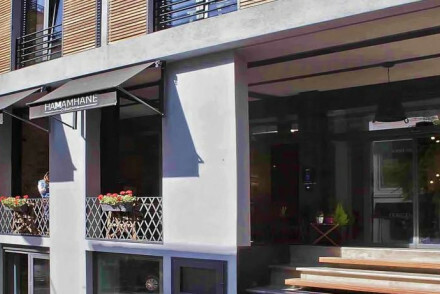 Nestled in Cukurcuma, 'the Soho of Istanbul', Hammamhane is a renovated apartment-hotel. All rooms are uniquely designed with an eye to contrasting traditional and contemporary styles. Exposed brickwork is the backdrop to colourful yet clean furniture. All studio units boast fully equipped kitchens. A striking Ottoman townhouse with enormous suites. Rooms and suites have high ceilings, chandeliers, floor to ceiling windows, parquet floors and creamy furnishings. Lovely lounge-bar-restaurant. 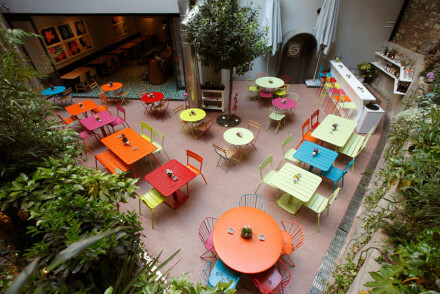 A stylish, romantic, and family friendly spot in the Beyoglu district. A chic contemporary hotel in the heart of the city. Architecturally impressive throughout, especially in the large central lobby. Rooms are smart and minimalist with floor to ceiling windows offering fabulous views. A sleek base to return to after a day spent exploring. There is a great restaurant. Local exploring - Ideally located in the heart of the city with easy access to all the main attractions. Local markets - Explore the bustling alleyways of the Grand Bazaar. Sights nearby - Visit the famous Blue Mosque and Hagia Sophia. 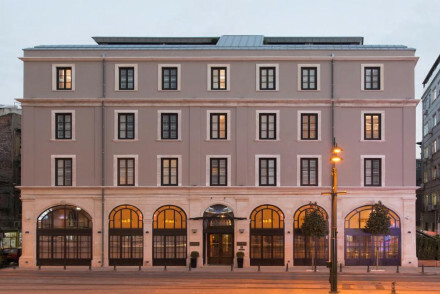 A beautifully restored, luxury hotel with a slick, modern decor inspired by the original bank interior. Bedrooms are elegant with high ceilings and opulent details. The hotel boasts a swanky bar serving refined cocktails, a spa and fitness suite. Great location for exploring the city. 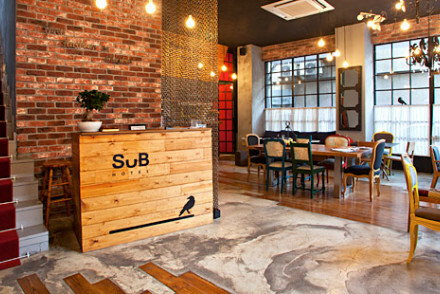 A large and impressive art hotel with cutting edge modern design. Enormous rooms and suites have all the mod cons, contemporary furnishings, balconies, and lots of natural light. Excellent restaurant, spa, and art gallery. Very stylish, very central. A sophisticated townhouse hotel in a fishing village outside Istanbul. Chic spacious rooms and suites in creams and ochres with stunning views over the Bosphorous. Restaurant, gym, and lots to do. Stylish and family friendly. Village - Ortakoy is an old fishing village outside Istanbul. Views - Stunning views over the Bosphorous. 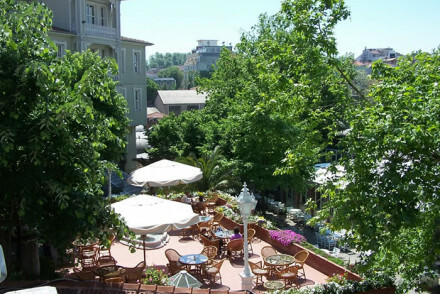 A small stylish hotel with an excellent restaurant and spa in the heart of the Sultanahmet. Contemporary rooms and family rooms have parquet floors, plush furnishings, and balconies. An excellent restaurant and terrace with spectacular views. 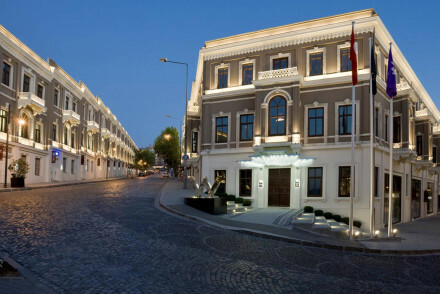 A super sophisticated hotel in Istanbul's most upmarket neighbourhood. Rooms and suites of epic proportions are sultry and sophisticated. Floor to ceiling windows, neutral tones, fireplaces, all the mod cons. Gym, meeting rooms, massage. Extremely sleek. City Style - A sophisticated hotel in an upscale neighbourhood. Sights nearby - Sultanahmet, the historic heart of Old Istanbul. A superbly renovated former convent with chic, but understated rooms and suites. Contemporary rooms and suites have lots of natural light, subtle tones, parquet floors and all the mod cons. Delightful bistro, roof top terrace, and minutes from the best shopping. Stylish, not pretentious. An area of tranquillity in an otherwise busy part of Istanbul, this hotel offers everything needed for a break from the hectic city. Private garden, gym and traditional massage facilities offer a sense of calm, complimented by the Italian restaurant and bar. The hotel is almost emission free. Views - Stunning views of the Bosphorus. A collection of historic buildings, reminiscent of the city’s Ottoman past, converted to a stylish hotel next door to Aya Sofya. Picturesque painted wooden houses each with 10 en-suite rooms and apartments in Ottoman style - maroon velvet, gilt and ornate furniture. A lovely garden terrace bar. City Style - Located next to the ancient walls of the Hippodome Splendon it is friendly and safe place to stay in the Old City. Local markets - For a spot of holiday shopping check out the vibrant and colourful Grand Bazaar. Sights nearby - Take a walking tour of the many beautiful Mosques that litter the city. Great walks - Head down to Emirgan Park for a breath of fresh air. One of Istanbul's more lively and stylish hotels. Chic contemporary design throughout. Rooms and suites some with four poster beds have all the mod cons, hot tubs, balconies. Excellent restaurant, cabana style terrace, and a bar that attracts party goers. 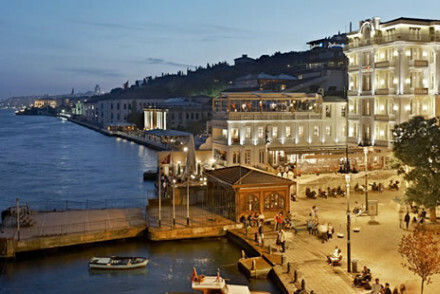 Lively - The hotel is a nightlife hotspot for some of Istanbul's most glamourous. Designer chic loft suites in a stunning location overlooking the Bosphorus. Loft-style suites have all the mod cons, crisp clean lines, fireplaces, polished wood floors, and kilim rugs. Excellent restaurant, terrace, and lots to do. Luxurious, romantic, and family friendly. Outstanding location - Magical waterfront views. 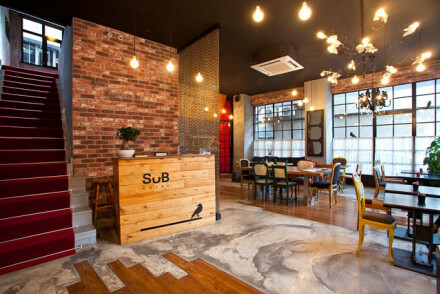 A sophisticated and contemporary hotel in Istanbul's arty Beyoglu district. Loft-style suites with wooden floors and large open spaces - ideal for the design conscious. Each room has a mini kitchen and microwave. Fantastic roof top sunbathing terrace. Well situated for getting around the city. Hideaway - The perfect bolthole in the city, with plenty of space, a well equipped kitchenette and outstanding one to one service. 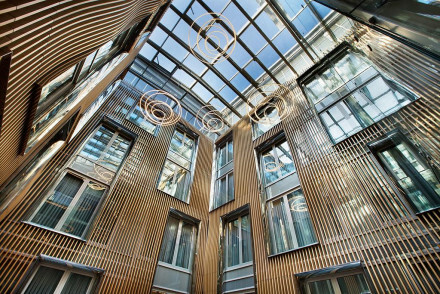 City Style - A chic designer hotel, dripping style from its avant-garde lofts, in Istanbul's uber trendy artists quarter, Beyoglu. Sailing - Get a totally new prespective and view the city by boat from the river Bosphorus. Local markets - Search for deals in the Modern Bazaar, a perfect spot for picking up treasures. A beautiful white mansion on the water's edge. Sumptuous elegant rooms and suites in creams with all the mod cons and balconies. Wonderful riverside restaurant and bar. Easy access to all attractions. Romantic, gourmet, family friendly. Foodies - Excellent selection of restaurants. 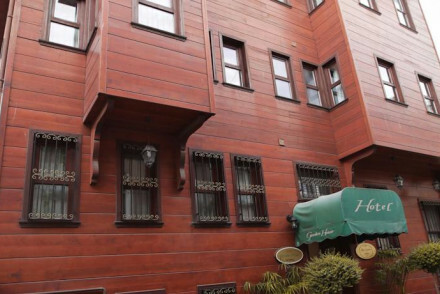 Sights nearby - Situated in the Beyoglu district, close to many major attractions. The Ciragan Palace Kempinski is the grandest hotel in Istanbul, former palace of the sultans, looking out over the Bosphorus to Asia. Sumptuous comfort in a wonderful setting. Romantic Break - A truly indulgent stay- palatial suites, sensuous fabrics, award winning cuisine, and spoiling spa treatments. Total relaxation - Spend days being scrubbed, wrapped and rubbed in the spa or lounging by the pool with a cocktail. Sights nearby - Dolmabahce Palace is 10 minutes away by car and the Bosphorus Bridge is nearby taking you to the historic part of the city. Local markets - Make a trip to the Main Bazaar and try out your haggling skills. A stunning hotel that combines modern design and timeless glamour. Stylish cosmopolitan rooms have parquet floors, elegant furniture, lots of natural light, marble bathrooms and giant balconies. Fantastic French restaurant and terrace. A very special hotel. 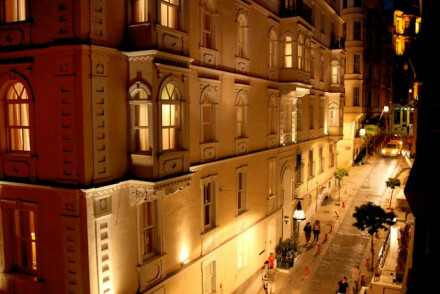 A five star hotel, in the heart of the old city, championing classic Ottoman style. 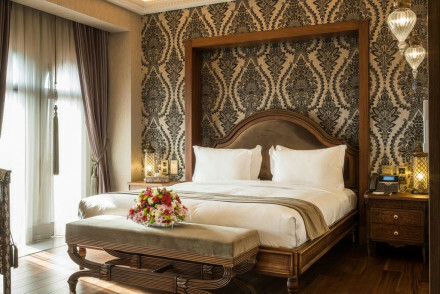 Luxurious rooms feature rich hues, dark antique furniture and ornate geometric patterns. Naturally there's all the mod cons too. A panoramic restaurant serves Azerbaijani cuisine and there's a indulgent spa as well. Local exploring - A luxury hotel in the heart of the city, an ideal base for city exploring. Sights nearby - Visit the city's major sights: Hagia Sophia, the Blue Mosque, the Basilica Cistern and the Topkapı Palace. Sailing - Take a Bosphorus tour and admire the city from the sea. Local markets - Wander through the narrow lanes of the Grand Bazaar. 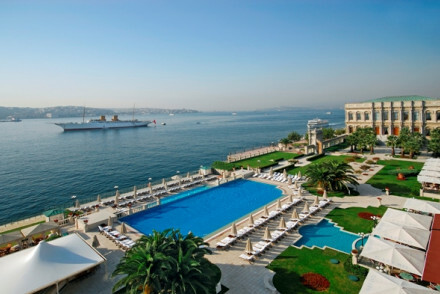 An impressive luxury 5* hotel with stunning views of the Bosphorus. Elegant contemporary rooms with large windows, crisp linen, antique furniture and traditional artworks. Enjoy the award-winning spa, rooftop pool and wide selection of bars and restaurants. Ideal for business or pleasure. Spa breaks - Nine beautifully designed treatment rooms and a hammam modelled on the 16th Century Turkish baths of Roxelana. City Style - Ottoman style glamour meets modern luxury in this elegant hotel overlooking the Bosphorus Straits. Local markets - Search for treasures in the buzzing Grand Bazaar, make sure you bring your bargaining hat! Sights nearby - The Blue Mosque, Hagia Sophia, and Topkapi Palace are just across the straits. 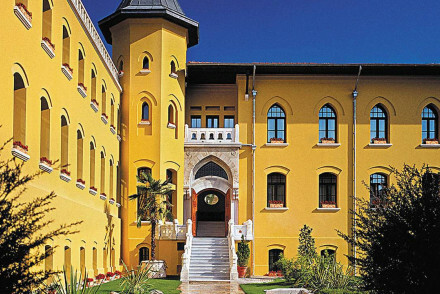 Ottoman style grandeur in this converted prison. Elegant rooms with large windows, soft hues and antique furniture overlook the historic part of the city. A small but indulgent spa. Dine on phenomenal cuisine in the pretty courtyard. A luxurious choice ideally placed to explore the city. Local exploring - Right in the heart of the most historic part of the city, with views over the Blue Mosque and Hagia Sofia, both just steps away. City Style - An elegantly restored neo-classic Turkish prison, boasting a perfect blend of East and West, contemporary and tradition. Sailing - Discover Istanbul from the waters on a cruise on the Bosphorus, for added romance try a sunset cruise. Sights nearby - Close to many of the most famous historic sites including the Topkapi Palace and the Blue Mosque. Pure opulence in this gorgeous riverside property. The ultimate place for romance and indulgence. Rooms feature rich coloured fabrics and walls and mix modern luxuries with traditional artifacts. A world renowned spa, private boats, elegant dining spaces and a glorious pool. A truly spoiling stay. City Style - A opulent hotel oozing elegance in an 18th-century Pasha's mansion- expect intricate ceilings, crown mouldings, and chandeliers. Spa breaks - Housing the famed Caudalie Vinothérapie Spa with an extensive therapy list, hamman and a number of pools. Sights nearby - Close to many of Istanbul's most famed sights including the Hagia Sophia, Blue Mosque and Topkapi Palace. Local markets - Explore the exciting warren alleyways of the Main Bazaar and haggle for a steal.